Managers say they have given direction to staff. Staff are confused about direction. Why? When Managers can’t understand why staff aren’t getting a message they feel they’ve been repeating over and over, everyone gets confused. And this issue does more damage the longer it is left to fester. Without a trusted and believable message, staff cannot take action. It’s like putting a wall in their way when the intention was to give them a slide. To move forwards, they will query each other, start making assumptions, jump to conclusions, and get complacent, if not destructive. We see this happening again and again. The result is that Managers get annoyed, recalling how they briefed their team members several times and wondering why they aren’t getting the responses they had expected. Those Managers will make assumptions about why: assuming that either staff aren’t listening, don’t care, or aren’t taking responsibility. Meantime, the team members will pick up on both the failed communication attempt and the annoyance around why it didn’t work. They will sense that the finger is being pointed at them and get frustrated with this disconnect. All the effort they are putting in to do their jobs and it’s their fault? They will rally together, and start speculating, assuming, and generally getting more disconnected. 1 – CULTURAL EXPECTATIONS: They’ve heard this kind of message before but it never materialised. Even as far as events 10 years back, once words don’t match the reality, it takes a lot of promise-keeping to rebuild that trust. STATEMENT: We are going to open the window to let some fresh air in. PERCEIVED MEANING: They said that before but we never ended up opening it. We’ll be asked to do something with the air vents instead. That’s what happened last time. 2 – BELIEVEABILITY: It doesn’t make sense. People need a presented reality to make sense before they’ll buy into it. If it doesn’t make sense, most people will make up a reality that does to be able to accommodate the new information. PERCEIVED MEANING: The window has tape around it. It’s never been opened. They’re bound to open the vent instead. Why are they telling us they’re going to open the window when it can’t be opened? For those in the thick of it, the reasons for the disconnect seem invisible. To those on the outside, it is clear: nobody is to blame. This is simply what happens when there’s too much ‘alignment fog’: misunderstandings, social influences, assumptions, unconscious biases, and information gaps that need extra attention. Those who really lead give it this attention. 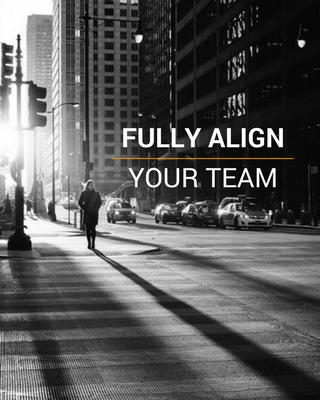 Clarity, alignment, and momentum starts with trustworthy and believable messages. They need to be presented in a way that allows people to ask questions and understand the implications from their perspective. Media messaging provides some context but only the Manager / Team Leader, in their unique position as having a pivotal relationship between the organization and their staff, can enable meaningful and actionable alignment.